Democrats in the Palmetto state may feel like they are getting snubbed by the candidates vying for the party's presidential nomination, but they aren't. The National Journal's Adam Wollner digs into some of the theories floating around South Carolina -- Clinton has a big lead in the polling conducted in the state mainly -- to explain the deficit. Collectively, however, they fall short of providing the context necessary to understand what is happening in the first in the South primary state. Comparing the state of play in the 2016 Democratic presidential nomination race to the 2016 Republican process or the 2008 Democratic battle is imperfect. Partly that is a function of the varying levels of competition in those respective nomination races, but another contributing factor is that there just are not as many candidates fighting for the 2016 Democratic nomination as there were in the 2008 race or are in the 2016 Republican primary. More candidates yield more visits. And that trend is enhanced when there is also a comparatively higher level of competition among a larger group of candidates. One way to shoot down the perception that South Carolina is getting snubbed and to highlight the above point is to compare the attention South Carolina receives from the candidates to that which Iowa receives (within cycles). In other words, compared to Iowa, what is the share of attention -- candidate visits -- South Carolina is receiving? During the competitive 2004 Democratic primary race -- one that was both contested and had more candidates involved than is the case in 2016 -- South Carolina had 183 visits (see Ridout and Rottinghaus 2008). Iowa was visited by the Democratic candidates 860 times. South Carolina, then, had approximately one-fifth the number of visits that Iowa did in 2004. 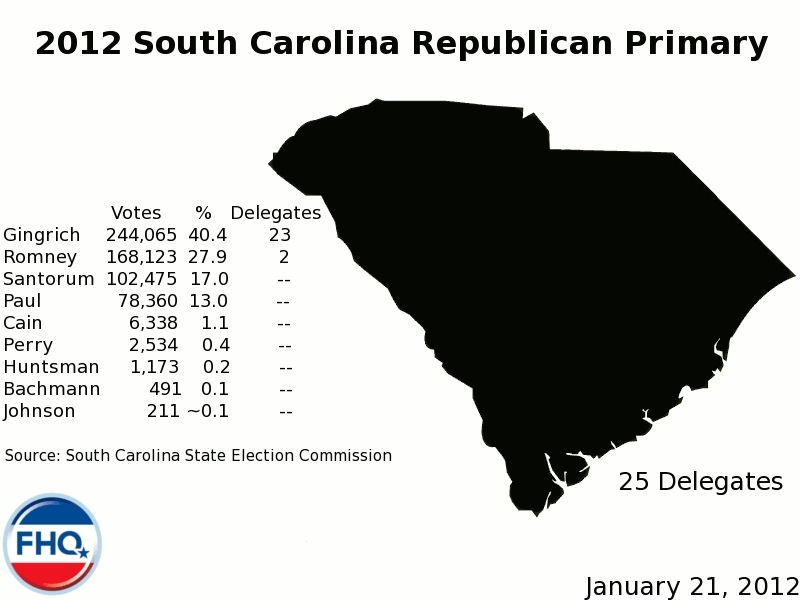 Four years later, South Carolina had 143 Democratic visits as compared to 1214 to Iowa (see Putnam 2009). In 2008, South Carolina had roughly 10% of the visits that Iowa received. As Wollner points out, so far this year, Iowa has had the Democratic candidates come calling 91 times. South Carolina has only had the candidates on the ground campaigning for just 19 days. That is a ratio that is comparable to the one South Carolina visit for every five in Iowa witnessed in the 2004 cycle. Looking at the just the raw numbers, visits are down for both (and across the board for all states for that matter). But, again, that is a function of the number of candidates involved in the race and how competitive it is. There is one other factor that feeds into the perception of being snubbed in the Palmetto state. Democrats there and elsewhere have not seen a competitive primary race since 2008. None of them really like the prospect of sitting on the sidelines in 2016. In South Carolina, Democratic activists and voters see Bernie Sanders doing quite well in polls in Iowa and New Hampshire and that that has not translated down South. Again, those folks do not want to be on the sidelines for four or eight more years awaiting a competitive presidential nomination race. They want a piece of the action that Iowa and New Hampshire are getting. But the thing is, neither the Hawkeye state nor the Granite state are really getting the attention either. There just are not enough candidates involved nor is the race competitive enough (see polling, endorsements and fundraising). 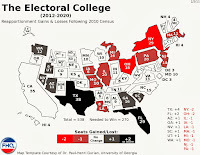 It also bears mentioning that of all the carve-out states, South Carolina is the least competitive in the general election phase of the presidential election process. If the Clinton campaign has one eye on the general election, then that May also push her to Iowa, New Hampshire and Nevada more. That does not appear to be the case at this point, however. Look, FHQ has followed Republican strategist, Mike Murphy, since before the time that there was an FHQ. And while he gave Sasha Issenberg a fantastic inside look at some of the thinking from within the super PAC that has aligned itself with Jeb Bush, the true nature of rules changes -- with respect to the delegate allocation process in the Republican Party -- really got lost in translation. Well, that's what the primaries are for, but the calendar's changed a little bit. We only have 10 pure winner-take-all states now. The Republican Party, we used to be the Social Darwinists: second place got you a Greyhound ticket to Palookaville. Now we're proportional, mostly by congressional district. From Feb. 1 to March 15, we have a bunch of big states; Ohio, Florida, Illinois, North Carolina probably. [Looks at primary calendar/map on wall of office.] I think my map's out of date now, I'm not sure we got North Carolina moved. So you've got this 45-day blitz of a tremendous amount of number of delegates being chosen, mostly—not all, as Florida's winner-take-all—but mostly in a heavily proportional system. First of all, there's no need to print up an outdated primary calendar and map and put it on the wall. You can always find one right here. FHQ's been updating that one since January 2012. More importantly, let's dive down into this winner-take-all and proportional stuff. Yes, the Republican National Committee has a set of rules that require states with primaries and caucuses in the March 1-14 window to allocate their delegates proportionally. But that is not a new thing. The proportionality requirement was added for the 2012 cycle and covered the entire month of March.1 The RNC did tighten its definition of what constitutes proportionality for the 2016 cycle, but the amount of delegates available in the respective windows is still about the same. Again, these are subtle changes. Applying the 2016 standard to 2012 would have meant a reallocation of just 28 delegates. That is a drop in the bucket. As FHQ has pointed out, the real distinction is between a true winner-take-all allocation and every other method. And Murphy does that. 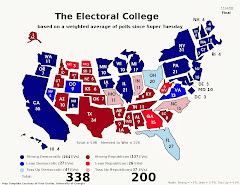 This idea that the Republican Party has transitioned from a winner-take-all system across the board -- something akin to the electoral college -- to the system in place for 2016 is just wrong. To restate, there was a proportionality requirement in 2012. It held the number of winner-take-all states to just six. That number in 2008, pre-proportionality requirement? 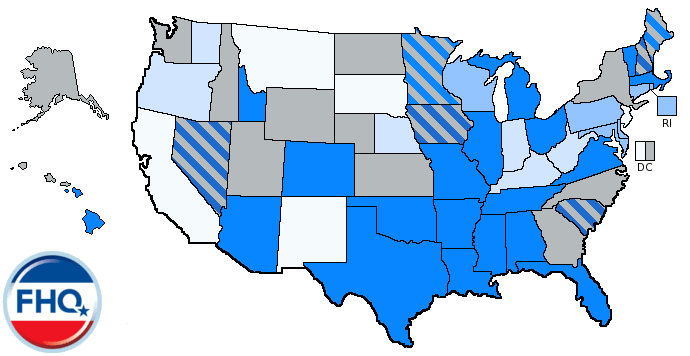 There were just eleven states that were truly winner-take-all in 2008. That is just one more than than the ten in 2016. And in both cases, the truly winner-take-all states represented approximately 20% of the total delegates. Those are not markers of significant change. That is perpetuating the myth of the winner-take-all Republican presidential nomination process. It was never like that. 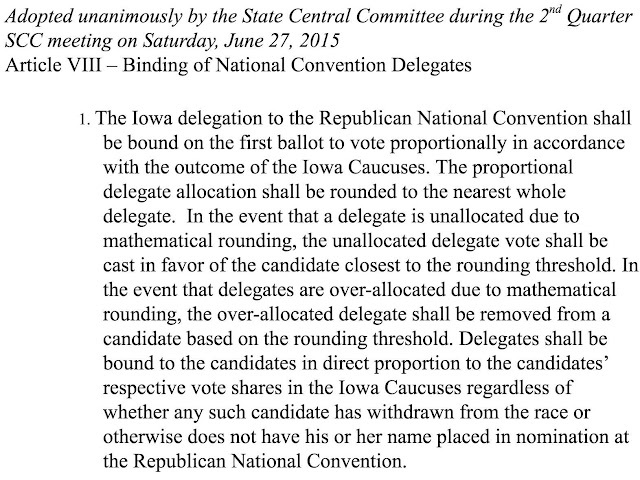 The RNC traditionally afforded states the latitude to set their own delegate allocation rules. Just as today, that meant a variety of types of contests; some winner-take-all, some proportional, some in between the two, and until this cycle, some caucus states sent unbound delegations to the national convention. Has the RNC changed the rules for 2016? Yes, it has. However, those changes are much more subtle than a lot are either letting or otherwise do not realize. Not all the tickets were to Palookaville. ...though at the end of the process when a nominee was clear it may have seemed that way. 1 The 2012 proportionality window contained contests that accounted for roughly 35% of the total number of delegates available in the Republican presidential nomination process. That number in 2016 is around 40% but in two fewer weeks time. 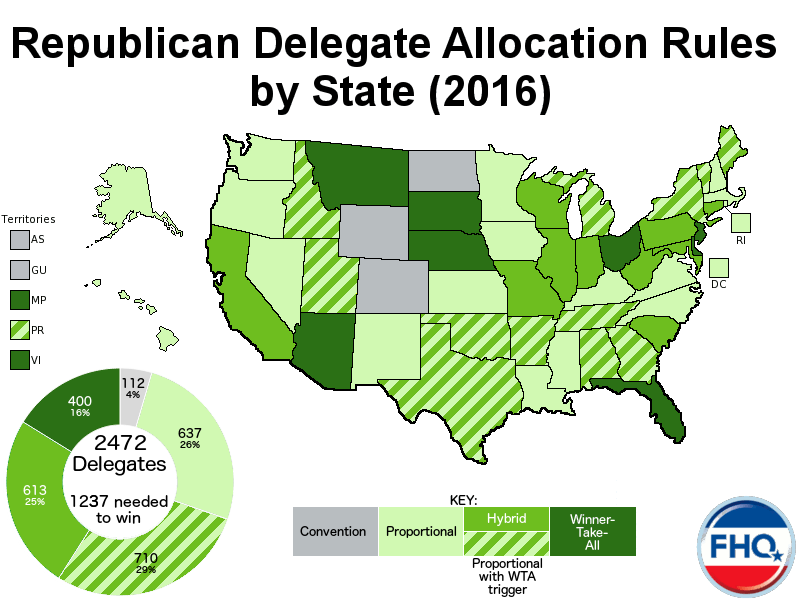 This is part three of a series of posts that will examine the Republican delegate allocation rules by state. The main goal of this exercise is to assess the rules for 2016 -- especially relative to 2012 -- in order to gauge the potential impact the changes to the rules along the winner-take-all/proportionality spectrum may have on the race for the Republican nomination. For this cycle the RNC recalibrated its rules, cutting the proportionality window in half (March 1-14), but tightening its definition of proportionality as well. While those alterations will trigger subtle changes in reaction at the state level, other rules changes -- particularly the new binding requirement placed on state parties -- will be more noticeable. South Carolina is unique among its carve-out state brethren. Sure, the presidential primary in the Palmetto state is First in the South, but the South Carolina primary represents the lone exception to the proportional delegate allocation that the other three states -- Iowa, New Hampshire and Nevada -- use. Actually, that distinction means South Carolina is the only non-proportional state (at least by the Republican National Committee's standards) before March 15 opens the post-proportionlity period of the 2016 presidential primary calendar. The other three carve-out states utilize an allocation system that proportionally allocates their respective shares of delegates based on the statewide result of the primary/caucus. South Carolina, on the other hand, is a state where the distinction between at-large and congressional district delegates matters. The key here is that in Iowa, New Hampshire and Nevada, the statewide vote affects a pool of delegates that includes at-large, congressional district and sometimes automatic delegates. In South Carolina the pool is separated. The statewide vote dictates who wins the 29 at-large and automatic delegates, and the results in the state's seven congressional districts directs the allocation of each district's respective three delegates. If a candidate wins the statewide vote, that candidate claims all 29 delegates. If a candidate receives a plurality in one of the seven congressional districts, that candidate is awarded all three delegates from that district. A statewide win means that the resulting allocation of delegates is weighted in favor of the winner. Said candidate would not only claim over half of the available delegates (29 out of 50), but would also be well-positioned on the congressional district level as well. Winning statewide tends to but does not necessarily mean doing well in the congressional district vote. While Newt Gingrich won South Carolina in 2012, he lost one congressional district and its two delegates to Mitt Romney. Similarly, John McCain won South Carolina in 2008, but split the then six congressional district with Mike Huckabee, yielding the former Arkansas governor 6 delegates. In both cases, the winner left the South Carolina primary with at least a three to one delegate advantage over the next closest competitor. And in Gingrich's case, it was more than 10:1. The South Carolina Republican allocation method, then, is built to advantage the winner more than a strictly proportional method of allocation, but less than a strictly winner-take-all scheme. It should be noted however, if a candidate wins statewide and in each of the seven congressional districts, then South Carolina essentially becomes a winner-take-all state. One additional area where there is some observed variation between states concerns how and how long delegates are bound to particular candidates at the national convention. The South Carolina Republican version of this has the delegates voting for the statewide winner or the winner of the congressional district on the first ballot only. If that candidate/those candidates is/are not nominated then those delegates are bound to the second or third place finisher statewide or at the congressional district level. If none of those three are nominated, then the delegates are unbound. Presumably, the system works the same way for candidates who may have won South Carolina delegates, but who subsequently withdraw from the race. Those candidates are less likely -- obviously -- to have their name placed in nomination at the convention in Cleveland. But should a winning candidate withdraw, then their delegates are then bound to the second place finisher. If that candidate drops out, then the delegates go to the third top vote-getter. In both cases, that delegate transference is dependent upon the candidate ultimately being nominated. If not, then those delegates will be unbound free agents. This is part two of a series of posts that will examine the Republican delegate allocation rules by state. The main goal of this exercise is to assess the rules for 2016 -- especially relative to 2012 -- in order to gauge the potential impact the changes to the rules along the winner-take-all/proportionality spectrum may have on the race for the Republican nomination. For this cycle the RNC recalibrated its rules, cutting the proportionality window in half (March 1-14), but tightening its definition of proportionality as well. While those alterations will trigger subtle changes in reaction at the state level, other rules changes -- particularly the new binding requirement placed on state parties -- will be more noticeable. While the presidential primary calendar and the position of New Hampshire primary specifically have changed over the years, the Granite state has always maintained its position as the first presidential primary in the queue and has had the same method of allocating national convention delegates for the majority of the post-reform era. That is to say, New Hampshire has been first and has allocated a share of its apportioned delegates to candidates based on their statewide performance in the presidential primary. There is a 10% threshold set by state law that candidates must reach or surpass in order to qualify for delegates, but New Hampshire, with so few delegates traditionally, is customarily less about the delegate score than it is about winning, placing or showing (as compared to expectations). Winning some small fraction of just 23 delegates means less, in other words, than punching one of the limited number of tickets out of the Granite state. It is the result that tends to winnow the field rather than the delegate haul. Still, since FHQ is here to discuss delegate allocation, let's do so fully. The one caveat to all of this is that fractional delegates round to the nearest whole number. Any leftovers -- unallocated delegates -- are awarded to the top vote-getter. 2012 offers a nice example of this practice. Mitt Romney won just under 40% of the vote. That cleared the 10% threshold and meant he was awarded a 39.3% share of the 12 delegates that were available in New Hampshire (post-penalty). 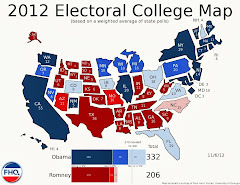 The former Massachusetts governor and eventual nominee received 5 delegates, Ron Paul netted 3 and Jon Huntsman got 2.1 The two remaining unallocated delegates -- again, out of 12 -- were allocated to Romney, the winner of the statewide vote. 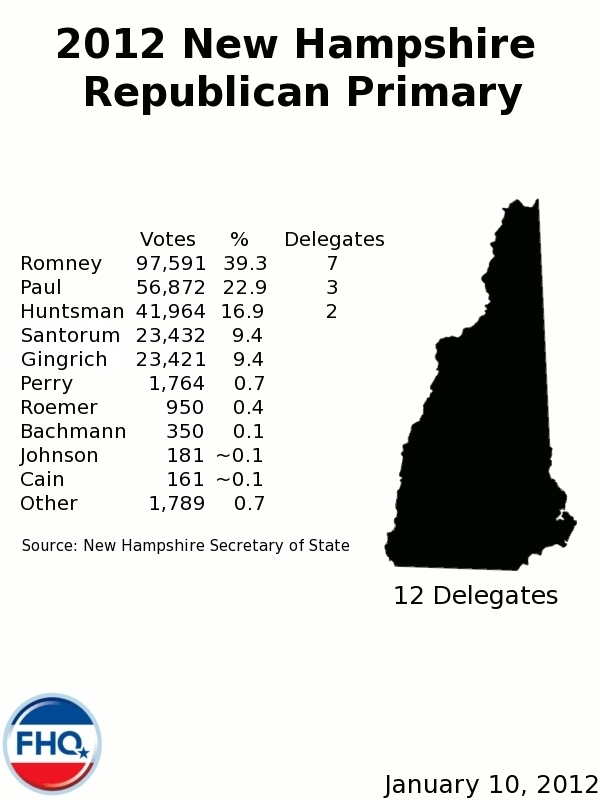 Romney, then, received less than half of the statewide vote, but got more than half of the available Granite state delegates. There is, then, a little boost that is provided to the winner in the event that there are unallocated delegates. That advantage may be enhanced even more depending on which candidates in a large field clear the 10% threshold. If many candidates qualify for delegates, the winner's cushion will be minimal, but if just a handful of candidates meet the vote share requirement, the number of unallocated delegates to be awarded to the winner will increase. That leaves 5 unallocated delegates; all of which would go to Trump. No, 12 total delegates is not that big of a deal in the grand scheme of things. However, 1) that is a victory with a nice resultant delegate advantage and 2) means that the winner -- Trump in this case -- would leave the Granite state with over half the delegates from a proportional primary. That latter fact is more significant in the race to secure majority control of at least 8 state delegations to be placed in nomination at the convention. That is an important point in the face of the arguments that proportional allocation in states will make getting to majority control in eight states more difficult. Yes, but it is more nuanced than that. Finally, should a candidate who has won New Hampshire delegates withdraw from the nomination race, that candidate's delegates are released and free to support a candidate of their choosing. 1 It is important to note that the denominator in determining the percentage is the total statewide vote and not the total of just the candidates over 10%. That, along with the number of candidates over the threshold, has big implications for how many unallocated delegates there will be. Convention: State will bind delegates to the national convention at a state/territory convention. Other conventions will leave the delegation unbound. Proportional: State will proportionally allocate delegates based either on the statewide primary/caucus vote or on the combination of the statewide and congressional district votes. Proportional with Trigger: State will follow above proportional rules but allows for a winner-take-all allocation if a candidate wins a majority of the vote statewide or at the congressional district level. Hybrid: State will follow some form of winner-take-most plan (i.e. : winner-take-all by congressional district) or directly elects delegates on the primary ballot. Winner-take-all: State will award all delegates to the plurality winner of the primary or caucus. October 1 came and went with little fanfare. But that was the deadline for states to have finalized and submitted delegate selection plans to the Republican National Committee for approval. Most of the rules have been adopted by state parties at meetings and conventions throughout 2015. That gave the RNC a chance to green light most of them as they became available. Some plans, however, are more available than others as FHQ found when trying to put together a "what do we know now about delegate allocation rules" post over the course of this week. Thankfully Zeke Miller at Time came along and filled in a number of those gaps. 1) Which states have new rules since 2012? Most of the changes cycle-over-cycle are from formerly non-binding caucus states that, due to a change in the RNC rules, had to adopt a binding plan. Iowa, Minnesota, Maine and Washington to name a few developed differing sets of binding rules. Two other states, Montana and Nebraska traded beauty contest primaries with non-binding caucus/convention systems for winner-take-all primaries. Others like Ohio made a switch to winner-take-all rules to advantage one candidate or another. 2) For (proportional) states in the proportionality window and out, is there a threshold that will limit which candidates will qualify to be awarded delegates? The candidates who fall into categories b or d are going to feel pressure in various ways to drop out of the race. The saving grace for those candidates in category b is if they are winning delegates, but staying in striking distance. 3) For other (proportional) states in the proportionality window and out, is there a winner-take-all trigger [see striped states above]? In other words, can a candidate win all of the delegates or all of the either statewide/at-large or congressional district delegates if they win the state or the congressional district? There are a lot of these trigger states on the calendar in the proportionality window. Their impact -- as potential winner-take-all states -- very much depends on the size of the field and competition among the candidates at the point that a contest is held. As FHQ pointed out in 2011 and again this year, the smaller the field is, the more likely it is that a backdoor winner-take-all contest will be triggered. It is difficult to see that with 15 candidates involved now, but the field will winnow and the calculus will change. 4) What else is there to know? Lots. There are rounding schemes and recalculations of delegate allocations and other sliding rules that are conditional. As always this process is a patchwork of rules in 50 states. There is a lot of variation; a lot of caveats. FHQ will be doing a tour through all 50 states as we did in 2012 and the additional territories where rules are available and state party officials willing to talk to fill in gaps. Updates will come often over the next couple of months and will be archived here for future reference. And here is the full report on delegate allocation rules from the RNC. North Carolina Governor Pat McCrory (R) signed HB 373 into law on Wednesday, September 30. The action untethers the presidential primary in the Tar Heel state from the earliest South Carolina presidential primary and sets a firm date (March 15) for the 2016 cycle. The move two years ago to push the North Carolina presidential primary away from the usual May date where it was consolidated with other primaries has been controversial ever since. Not only did it introduce budgetary issues -- having to fund a new and separate presidential primary election -- but it made the state's parties vulnerable to national party penalties for conducting their delegate selection processes through a non-compliant (too early) primary. Both factors put almost instant pressure on partisans in the legislature to make a change. The General Assembly sought to deal with the latter factor (primary timing) first and in the last months has moved to shift the May primaries up to coincide with the earlier presidential primary to solve the budgetary expenditure. Now that the bill has passed the legislative hurdle and been signed into law all of that is settled for 2016. That means that the March 15 North Carolina presidential primary will coincide with similar contests in Florida, Illinois, Missouri and Ohio. However, bear in mind that this change -- North Carolina primaries in March -- is only in effect for the 2016 cycle. The date called for in the law is specific to 2016. That means that everything will revert to the way it was prior to the signing of this law after 2016. The regular primary will shift back to May and the presidential primary will once again be tied to the South Carolina presidential primary. That is not unlike how New York has handled its presidential primary scheduling the last two cycles. The primary is scheduled on a February baseline, but has been shifted temporarily -- with a sunset in the law -- to compliant dates for 2012 and 2016. Strategically, that method forces the legislature to think about and act on the presidential primary date every cycle (as opposed to letting the negative inertia of a late, consolidated primary lead to a maintenance of the status quo; a late date). But for now, North Carolina is compliant with national party rules and will have a March 15, 2016 presidential primary date.